Cunninghame Housing Association, working in partnership with East Ayrshire Council and the Scottish Government, held an official ceremony on Tuesday 22nd November 2016 to mark the progress achieved to date on the site of the new build development at Hill Street, Kilmarnock. The event was attended by Kevin Stewart MSP, Minister for Local Government and Housing who was there to officiate and recognise the progress of the works on the site since the project commenced in September 2016. A total of 45 houses and flats, all for affordable rent is being delivered on the site comprising a mixture of 2 and 3 bedroom general needs houses, amenity cottage flats for older and less mobile people as well as 2 properties designed specifically for those with wheelchair needs. A total of £3.55 million has been awarded in grant from the Scottish Government. The project will take around 13 months to fully complete with overall completion scheduled for October 2017. The main contractor, Ashleigh (Scotland) Ltd, is working closely with the Association to deliver a programme of Community Benefits with 4 new apprentices all from Ayrshire starting as a result of this project. In addition, Ashleigh is mentoring a local young person from Kilmarnock Academy and offering them career advice, assistance with presentation skills and with time management. The perimeter hoarding which surrounds the site has been painted by local school pupils from Kilmarnock Academy, Hillhead Primary and St Joseph’s Academy. The schoolchildren approached the task with enthusiasm and enjoyed the experience. Ashleigh has also visited the local schools to give presentations to the pupils about the construction works and the importance of Health & Safety as well as running design competitions for the pupils with prizes offered to the successful pupils. “As well as Community Engagement playing a key role in the delivery of this project, there are also clear economic benefits with new apprenticeships and training opportunities being at the heart of this new development. “From a works tender sum of £5.36 million for the Hill Street site we believe that circa £4.7 million or 87% will be recirculated within the Ayrshire economy through the contractors own trades, suppliers and sub contractors”. 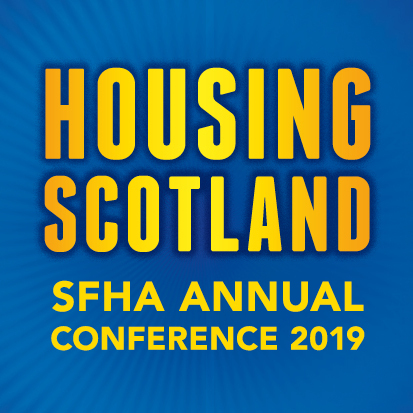 “I am delighted that the Scottish Government’s affordable housing supply programme is able to support this project with a grant of £3.55 million. This will support the delivery of these affordable, high quality homes and will help address the demand for social rented housing for people in the East Ayrshire area.